Cleaning the wheels on a car or bike can make a big difference. The wheels come into contact with various types of grime and dirt that might prove to be very difficult to remove. A simple guide will give insight into cleaning the wheels with less risk of damage or swirls. Beginning on the inside of the wheel, first spray with an All Purpose Cleaner and rinse to remove as much surface grim as possible. Now move on to a dedicated wheel cleaner. Spray onto the wheel and work with a brush. Large brush for large areas. Small brush for tighter areas. Repeat on the wheel face. Large soft bristle brush covers the face. And smaller brush for the details. Note that heavily bonded tar and grime can be removed with a tar and glue remover, not listed here. Claying can also help remove bonded grime. 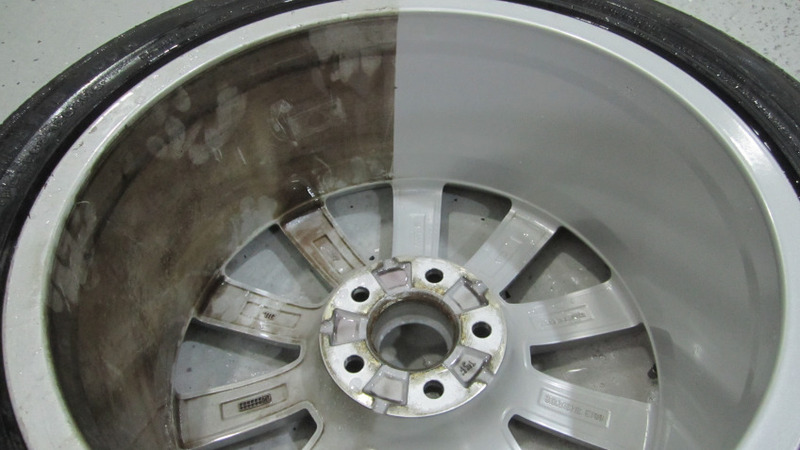 Corroded parts of the wheel can only be fixed by refurbishment. Dress the tyre (optional) using a tyre dressing (Meguiars Hot Rims used here…). Rather than spraying onto the tyre, apply with an applicator pad for more even application and less sling. * Some users may not wish to use a wheel protection product if a lot of brake dust coverage is experienced. While a wheel sealent can make cleaning easier, for some cars the brake dust can still settle easily and be hard to clean, necessitating regular use of a dedicated wheel cleaner in which case a wheel sealent is a pointless addition to the regime. Never go underneath a car supported by the supplied jack – always use axle stands if you wish to work underneath the car (engine undersides, chassis undersides etc). Always jack the car up at the manufacturer’s recommended jacking points. Ensure the jack is in stable contact with both the jacking point (see owner’s manual) and the ground. Always work on level ground. Place a wheel chock (or brick) on either side of the wheel diagonally opposite to the one on which you are working to prevent lateral movement of the car. Use the spare wheel – locate underneath the body either behind or infront of the jack as an additional support should the jack fail which the car can land on – do not rely on this to safe you, it is simply one of many precautions. If you have the wheel off the car for prolonged periods of time (for waxing, polishing etc) and you are using the supplied jack, put the spare wheel on the car and lower the car back down rather than leaving it on the jack for a prolonged period. The jack is simply designed to hold the car in the air for a short time to allow wheel changes. Keeping the car in the air for a prolonged time requires the use of dedicated axle stands. Wheel cleaners can contain certain harsh chemical that help the cleaning ability. 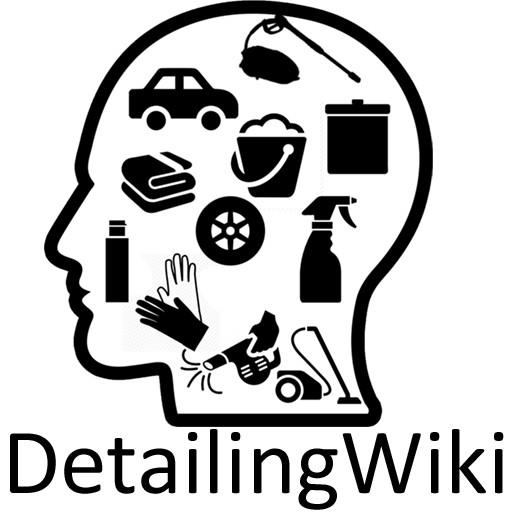 These chemical can be bad for your health, and since you might be working very close to the subject you are cleaning, you are more likely to inhale part of these chemicals. It is very much recommended to wear proper mouth/face covers and wear suitable gloves. The purpose of this tutorial is to outline a basic step guide to cleaning the wheel on a car. It is not designed to be fully detailed but rather give a basic outline of some methods and techniques based on general products that most detailers are likely to have lying around.